Nobleford is Alberta’s most sustainable municipality, according to a recent Canadian Federation of Independent Business report. The Alberta Municipal Spending Watch Report, which was released in December 2018, looked at municipalities in Alberta with populations over 1,000 people, and analyzed their operating spending habits between 2006-2016. During that time period, inflation-adjusted — or real — operating spending by municipalities grew by 62 per cent, while population increased by 24 per cent. While the report deemed that the vast majority of the 186 Alberta municipalities had been studied have issues with operating spending, that wasn’t the case for the Town of Nobleford, which placed first in the report’s ranking. “(I’m) pretty proud; proud of our CAO (Kirk Hofman), proud of our staff, proud of our PWs, I mean everybody goes into something like this, and previous councils,” said Don McDowell, mayor of Nobleford. “I think what it shows to the municipality, to the citizens of Nobleford, is that they’re getting the best possible value for the dollar spent. I mean, that’s what the survey is; it shows that we’re on the right track, if you will, to keep this community strong and vibrant as it is right now. 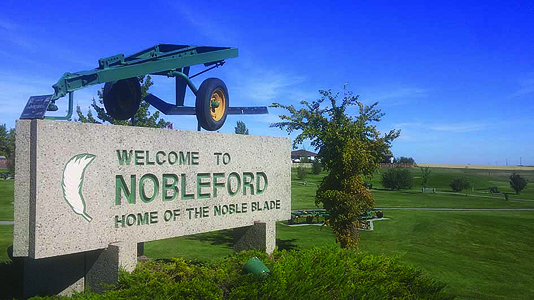 According to the report, between 2006-2016, Nobleford had a population growth of 48 per cent, and a 62 per cent growth in real operating spending per capita. Between 2015-2013, there was a 3 per cent reduction in real operating spending per capita. With a cumulative real operating spending per capita of $755.67 — much lower than the provincial average of $2,325, and the lowest in the province — and a 10 per cent growth in real operating spending per capita, the report deemed Nobleford as being “Alberta’s most fiscally sustainable municipality”. “We have just received (a) financial indicators report from the province of Alberta in December, saying that Nobleford has one of the highest asset values per capita. What that means is we spend the most money on infrastructure and assets, so we’re ranked very high,” said Hofman. “So now with this recognition from the Canadian Federation of Independent Business, it shows we have the best of both worlds; you’re getting some very high quality infrastructure in Nobleford, and we’re doing it at the best possible cost, the most efficient as you can get. McDowell credits the municipality being “frugal” for the ranking. Noting that they are about a 20 minute drive the City of Lethbridge and its amenities, it enables the town to focus on infrastructure and other things that may not be considered exciting — such as water and sewer services. However, that doesn’t mean the town shies away from big projects. The town has recently completed a $1 million clean water storage dome to double their water capacity, and have $3 million sewage lagoon project that will start later this year. They are also working to attract more businesses to their downtown area. Although Nobleford has less staff then other municipalities, Hofman said they are paid very well, “better then other municipalities pay them”, and they achieve results. Nobleford had previously placed ninth overall in the October 2017 edition Alberta Municipal Spending Watch Report, first in the September 2015 Alberta Municipal Spending Report and placed second in the November 2014 edition of the Alberta Municipal Spending Report by CFIB. “It is one thing to compete against smaller municipalities, but we’re competing against larger (municipalities), like Edmonton, Calgary, Lethbridges all over, so that’s a tough measure to continue,” said Hofman.